Despite the bankruptcy of Hanjin Shipping and a severely depressed charter market, resulting in the company posting a $139m net loss for 2016, containership owner Seaspan Corporation said it “remained committed” to its business plan. Revenue for the full year was up 7.2% on 2015 to $878m, due to the impact of the arrival of newbuild vessels. This was partially offset by lower average rates on short-term charters on the existing fleet, together with the Hanjin default. Seaspan was also obliged to recognise $285m in impairment charges during the year on 16 ships under 5,000 teu, due to the deterioration in market rates and the consequent decline in the vessels’ market value. Seaspan operates a fleet of 88 container vessels ranging in size from 2,500 teu to 14,000 teu, which it leases to ‘blue chip’ container shipping lines on a long-term, fixed-rate basis. It has $5.2bn in contracted revenue and the average length remaining on its charters is six years. The failure of Hanjin in August last year left Seaspan with $19.7m in unpaid charter hire and three 10,000 teu ships – previously on long-term charter to the South Korean carrier – without employment. Seaspan said that a short-term charter had been found for only one of the ships since they were returned by the bankrupt carrier, but that from April all three vessels would have employment for a period of 12 months, plus options. However in the interim Seaspan has incurred substantial operating costs for the ships, as well as having to continue to make mortgage payments. Furthermore, the daily hire rates for the new charters will likely be only about one third of the terms of the original Hanjin charter rates. In a results conference call yesterday, CEO Gerry Wang admitted that 2016 had been “a challenging year” for Seaspan but said he was convinced that “a corner had been turned” and said the company “remained committed to our strategy”. “While some in our industry will have great difficulties to survive, we know that the best returns occur during periods of weakness and in down cycles,” said Mr Wang. “Seaspan was born during the Asia financial crisis (1997) and it is part of our DNA,” he recalled. “We will be looking to modernise the fleet with selective acquisitions and modernisations, primarily through distress options, which could be ships that may have been left at shipyards by owners, or ones that that are under contract but whose owners are under financial distress,” said Mr Wang. The need for a war chest was the reason given by the company for reducing the dividend on its common stock from 37.5 cents per share to 12.5 cents. “We believe this decision is in the long-term interests of our shareholders,” said Mr Wang, who argued that the move was “both defensive and offensive”. Seaspan currently has eight ships under construction stemmed for delivery this year. 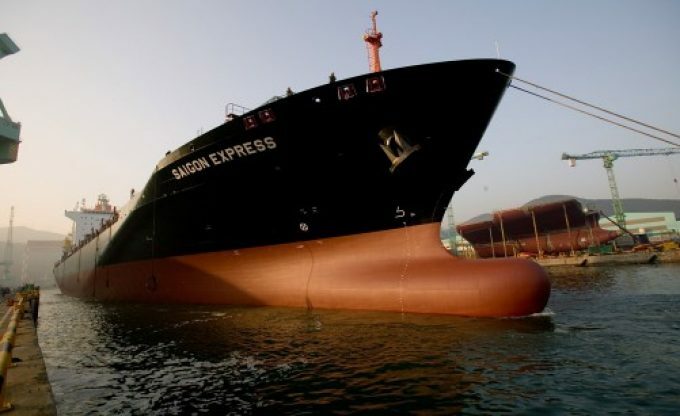 These consist of one 14,000 teu vessel, which will be chartered out to Yang Ming for a 10-year period; five 11,000 teu ships which will be bareboat chartered to MSC for 17 years; and two 10,000 teu ships that currently do not have a charter attached. Mr Wang advised that Seaspan had concluded successful negotiations with the ship builder to defer the delivery of the 10,000 teu vessels until 2018. Seaspan did not advise the total amount of its claim submitted to the Seoul Bankruptcy Court for the unpaid charter hire and charter party default by Hanjin Shipping, but rival non-operating shipowner Danaos said last week that it had filed a claim for $598m.